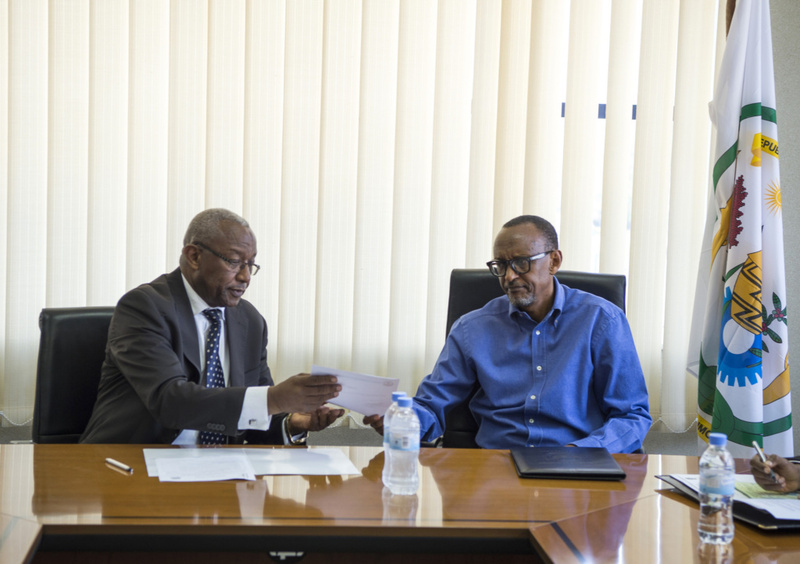 Candidate Paul Kagame 59, has won presidential elections with a total of 6,650,722 votes (98.63%), according to provisional results that were published on Saturday. Candidate Frank Habineza 40, the flag bearer of the Democratic Green Party of Rwanda (DGPR) has scored 31,633 (0.47%) total votes . Provisional results also indicate that independent candidate Philippe Mpayimana 46, fetched 49,117 votes (0.73%). “It is clear RPF and Paul Kagame is the winner. I can only congratulate the president. As for me, I will keep serving my country in different capacities,” Mpayimana said on Friday while at Capri hotel in Nyamirambo toasting to the end of an aggressive electioneering process that lasted 20 days. While conceding defeat, Mpayimana started asking airtime on public television to say his satisfaction of the results while the national electoral commission was announcing preliminary results as they come. He was given time to speak twice. In the contrary Frank Habineza only conceded defeat after all announcement of all the provisional results. Habineza thanked all the government institutions and voters for the good conducts of elections, but said he needed some issues to be fixed in the future. “Those include some local authorities who were not cooperative and the hindrance to our election observers/party agents,” he said. While preliminary election results were announced, RPF supporters were gathered at the party’s new headquarters in Rusororo sector, Gasabo district in celebration mood with president elect. “What we have received is that RPF has won. So I want to thank the leaders and supporters of RPF and all Rwandans, the victory is yours,” Kagame said. The president acknowledged eight political parties who rallied behind RPF in the elections. “I cannot forget to thank my family because they were very supportive,” Kagame said. Private individuals were also acknowledged for contributing financially for the good conduct of the campaigns. Kagame was very thankful to organizers of the rallies whom he said, are predominantly young people aged between 18 and 30 years. Rwandan artists who warmed up campaigns were also recognized. Kagame also paid tribute to media fraternity for its role during the electoral campaigns, and the elections. “Through different platforms including photos, social media… you enabled the world to follow our campaign as it happened. You did a great job,” he said. The president reiterated the process that led to this day – the will of the people who proposed change of the constitution. “I am here because I respected what you asked me to do. Despite the critics of our democracy, you have proven that Rwandans know what they want,” Kagame said. Meanwhile, the Diaspora community were at Rwandan embassies following vote counting ongoing back home. 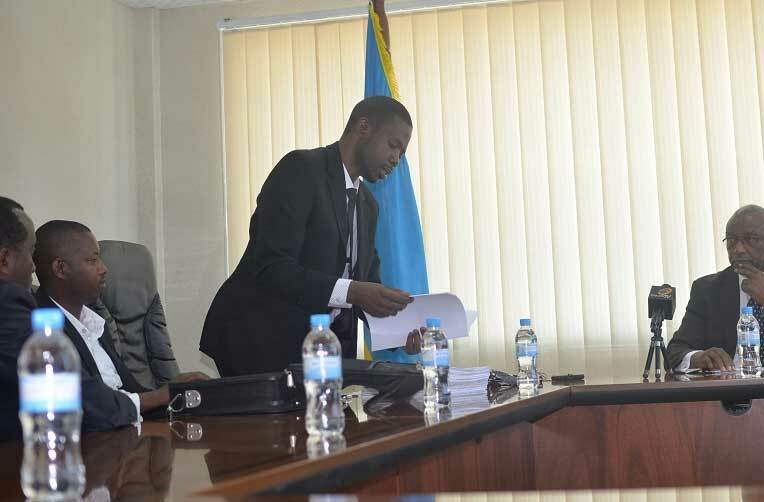 According to provisions of the electoral law, the winner must attain at least 50% of the total votes counted and is sworn-in as president of Rwanda two weeks after the final results are announced. Presenting the outcome of the presidential elections, Prof. Mbanda said that a total of 6, 897,076 voters turnout for polls. There are 2,340 polling stations across the country with a total of 16,691 rooms. The elections were monitored by 1800 observers including 400 foreign. In the Diaspora alone on Thursday a total of 44,362 voters turned up at 98 polling stations. For the national electoral body, the elections were generally peaceful, started on time and concluded at 3pm however, a few voters arrived at polling stations minutes after closing time. Presidential campaigns kicked off on July 14th with three candidates hitting the field soliciting for votes. 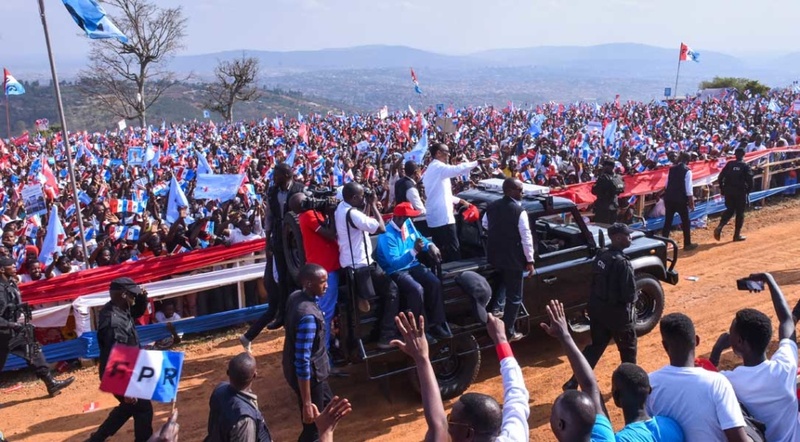 Although the first campaign week was tense for the candidates, the RPF party had an upper hand – it had planned earlier and attracted larger rallies. Independent candidate used a mega phone walking door to door convincing voters. At some point campaign rally site remained with empty chairs for almost 2 hours without any supporter turning up. However, deep into the campaigns, Mpayimana managed to attract sizeable rallies and hired a mobile sound system. Frank Habineza hit a wall when he drove to campaign in Nyagatare and Gatsibo districts both in eastern province. Local authorities in Rwimiyaga sector in Nyagatare district canceled Habineza’s rally arguing that he had assembled near the market on a market day. This prompted him to drop the rally and drove to nearby Gatsibo district where also rowdy motor taxi operators covered in tree branches disorganized him along the way but later managed to address supporters at a rally. For candidate Kagame, the RPF party meticulously planned its rallies and provided drinking water, big tents, entertainment and promotional materials. Interesting at RPF rallies, women took the centre stage moderating, protocol and mostly giving emotional testimonies reflecting personal and collective transformation under Kagame leadership – for this strategy, supporters identified more with their candidate. Whenever candidate Kagame picked the microphone, supporters anxiously waited for his powerful quotes and he never disappoints. For his heroic credentials, millions of Rwandans cannot miss having a glimpse of Kagame. 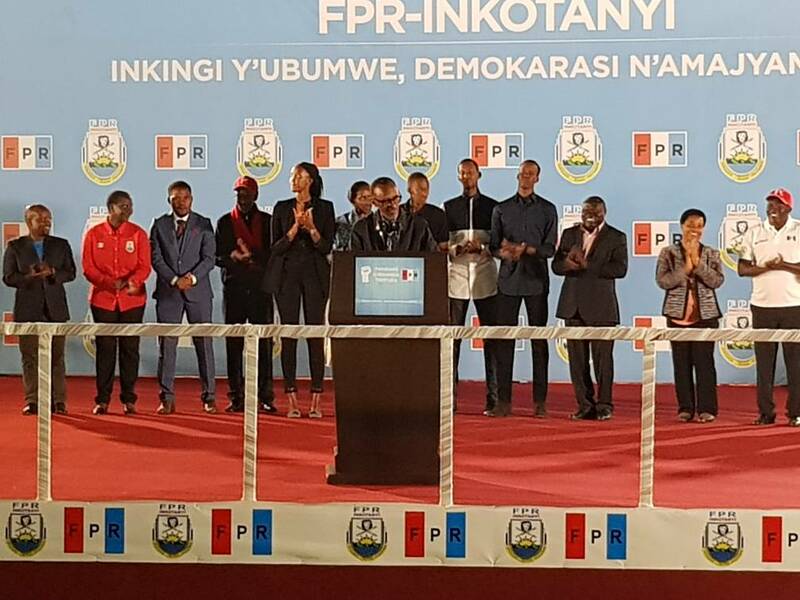 Also supporters of all eight opposition political parties allied to the Rwanda Patriotic Front not only endorsed Kagame as their candidate but also boosted the RPF rallies. 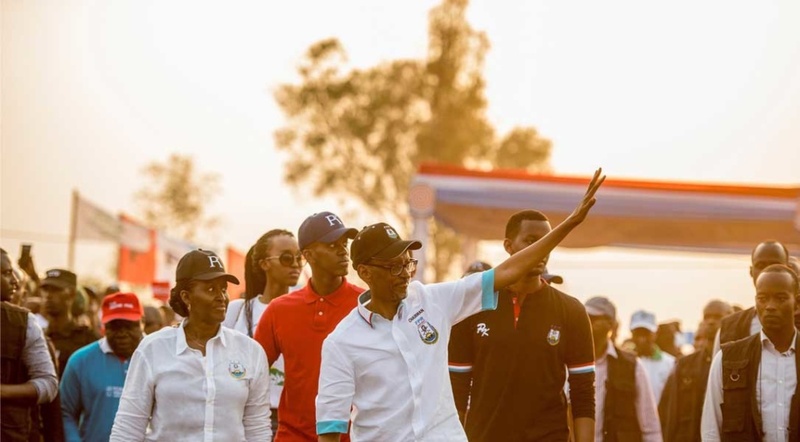 Candidate Kagame always arrived at his campaign rallies with his wife and children which is not usual – this also played a big role at the rallies. In a recent referendum conducted on December 19th, 2015 to amend the constitution, 98% of the voters agreed to the revision of article 101 and for Kagame this was victory secured. Under the revised law the seven-year term was scraped and permits presidents to serve two five-year terms beginning with 2024.